The Chennai based automobile company is the recent name among the auto majors who have found a new market in our neighboring country, Nepal. CG Motocorp in Kathmandu is the official dealer for TVS bikes in Nepal. The vehicle is promoted not as a simple commuter’s choice but as a premium bike that will give users a spirited ride without compromising on mileage. The company expects good sales as the timing of the launch is scheduled just before the upcoming festive season of Dashain Tihar in October and special discounts are in the offing. Currently, the TVS Phoenix price that is being quoted in Kathmandu is 1.69 lakh Nepalese Rupees. It is equivalent to 1.06 lakh INR. 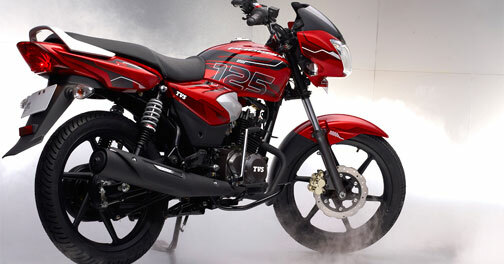 TVS Phoenix is one of the two 125 cc bikes launched by the automobile firm. Even though it did not reach the success levels of Victor, the two-wheeler performed better than its predecessor Flame. The most successful points that have helped its sales in India are the mileage and price. While the pricing in Nepal is much higher than the Indian price, we have to wait and watch how our neighbors embrace this spirited ride. Populer TVS Phoenix features are impressive and rider friendly. This is one of the first two-wheeler in the commuter segment that offered hazard lamps like the ones usually featured in the cars. The two-wheeler also sports LED pilot lamps. From the TVS Phoenix pictures, you can see the fully digital speedometer with an amber backlight. You can also see the cluster of instruments including digital fuel gauge, trip meter, service meter and low battery reminder. Most of these features are introduced as first in segment attributes which gives the vehicle a premium touch. It sports aircraft themed decals as the design is also based on the shape of fighter jets. Alloy wheels and soft texture grips add more value to the recently launched two-wheeler. The power to weight ratio is supposed to the highest in its segment and this gives the model an edge in maintaining an impressive mileage of 67 kmpl. Eco thrust technology is also used in the bike which is a tuning technology to maintain a fine balance between the power provided and the fuel economy. The bike with its 125 cc eco thrust engine is capable of producing 11 PS of power at 8000 rpm. Drum brakes are offered as standard in the basic variant with the buyer having an option to upgrade to disc brakes for an added premium and TVS Apache RTR 250 may be launched in 2014 in the India.